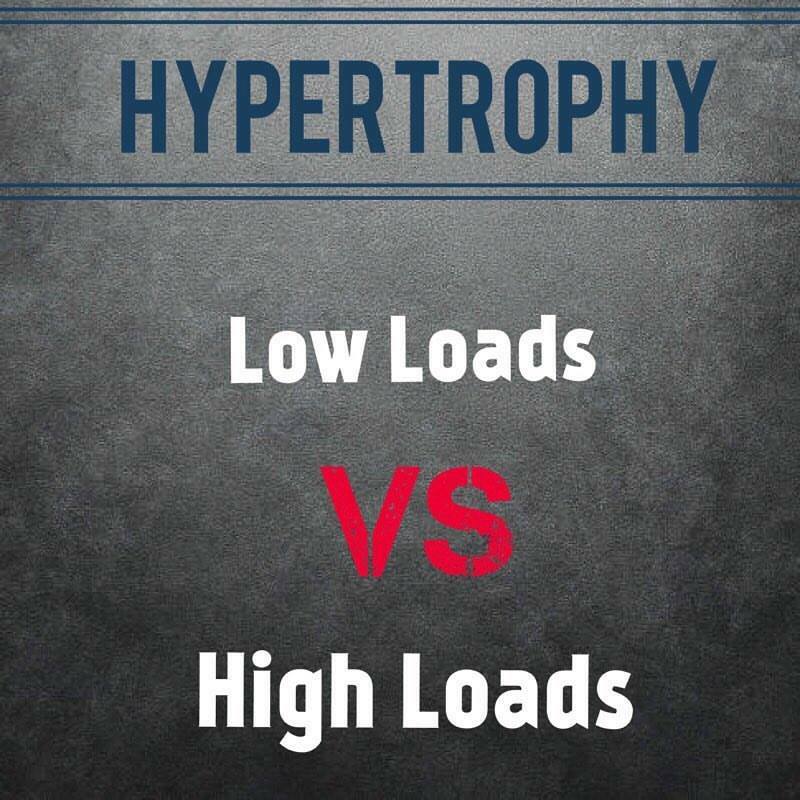 Hypertrophy: should we use low loads or high loads? September 26, 2017 September 26, 2017 by Nils Oudhuis . Whether using low or high loads, the most important factor for maximizing hypertrophic responses is total volume and, probably, exertion. Low loads lead to hypertrophy due to metabolic stress as the main feature, so fatigue is a very important factor to consider. Picture made by Luis Mesquita. – Velocity and exertion of the 39th rep of a 40 reps set (to failure) is about the same than the 4th rep of a 5 reps set (to failure). So you still need to get tired, even when using low loads. – Given that total work volume is the key aspect for hypertrophy, e.g. 50 total repetitions using low loads vs. high loads, the training session will be shorter when using low loads, since rest periods will be shorter between sets. – It all comes to the final goal desired. Do I want greater muscle cross-sectional area in order to increase force production, or just for aesthetic reasons? The two interventions will have different outcomes: (a) with the same total work volume, low loads won’t have the same impact on neural adaptations as high loads do, so increases in strength, power and speed will necessarily be different and (b) low loads/high repetitions involve different energy pathways, with greater emphasis on local muscle endurance. Strength and hypertrphy adaptations between low-versus high-load resistance training: A systematic review and meta-analysis. Luis Mesquita is a licensed Physiotherapist and Certified Strength and Conditioning Specialist. His education and professional background are focused on athletic development and injury risk reduction, which gave place to a project called Bridging The Gap: Rehab & Performance. At the moment, he is working as a S&C coach for EXOS with Chinese Track and Field athletes. Is Quadriceps H-Reflex excitability a risk factor for Patellofemoral Pain?